Yesterday Jeff Kaplan, lead designer on the Overwatch development team, announced that Overwatch will be adding two new deathmatch modes into the game’s arcade. Deathmatch, a popular game mode in first person shooters, will allow players to strive for getting the most eliminations without any objectives. Players will also be able to play any character from the game’s roster, so there are all kinds of options and opportunities for different types of play within these modes. 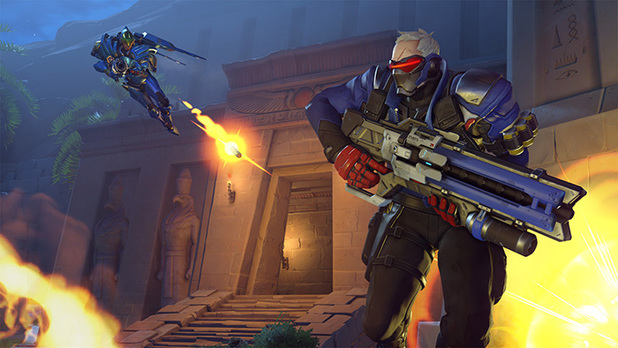 Overwatch has previously only featured objective-based modes while working a little with elimination modes in the arcade, however they still have yet to feature a true mode of play which fully encourages elimination-based competition – until now. The two modes being introduced to the game are free for all (FFA) and team deathmatch (TDM). In FFA there will be eight players without teams all fighting against each other to get the most eliminations and win the game. The top four players will be granted a “win” (which means they will get a point towards the three free lootboxes available for getting wins in the arcade every week) while the bottom four will be given losses. In TDM there will be two teams of six players which will go head to head, the first team to the set amount of eliminations wins the match. There are a lot of interesting ways to play and different combinations of teams. For example, one thing I found interesting as a Mercy main, is that Mercy’s ultimate ability will not only revive fallen teammates but also in turn remove those kills from the enemy team’s score. Deathmatch makes you rethink Overwatch; instead of working together towards and objective such as capturing a point or moving a payload, you are supposed to simply eliminate the other team as many times as possible. For more details check out the developer update embedded below. If you have the PC version of Overwatch, both deathmatch modes are now available in the PTR (public test region) for you to play around with and enjoy. Having recently purchased the PC version of Overwatch myself, I was able to play a bit of both modes today in the PTR. I found both modes to have a lot to offer. It’s a totally different feeling to not be concerned with a payload or capture point, to just be focused on eliminations and such. There are some interesting team dynamics and since right now there are only four players on each team (Kaplan says six per team in the update video so I assume the four per team setup is only a PTR thing) you see some interesting combinations. When playing TDM in the PTR I was always Mercy as I am skilled at healing and eliminating with her, however most of the teams I played against didn’t have healers at all and focused primarily on tank and offense picks rather than support or defense picks. It seems to work in some cases, but not always. I think it all depends on how the team is playing together, if all players are offense but skilled in those positions then it will probably be successful, same can be said for a team of tanks with a healer and other combinations. Playing who you know and who you are skilled with seems to be key. In FFA though, anything goes. I played a match in which a Lucio player won, for example. It’s all about who you are good at getting eliminations with as well as who has the most self-sufficiency. Characters like Lucio or Zenyatta can be just as destructive as Widowmaker or Roadhog when played right. There are a lot of interesting dynamics happening in FFA since it’s you against seven other players. You can’t rely on a team or even a partner, just you and your own skills. Both modes were honestly a lot of fun to test out and play. The Overwatch community as a whole has been asking for deathmatch modes since the game’s release and I’m glad that these modes are finally being added. Many players have become increasingly frustrated with the hardships in quick play due to certain folks not wanting to play the objective and instead just playing for eliminations. These types are in almost every match I play nowadays and it’s frustrating as a healer (due to the lack of players defending me while I heal them) and just as a general player to have one or more teammates care so little about actually winning just so that they can get more eliminations when the numbers don’t matter. This has been a general issue since Overwatch was released, but with the addition of deathmatch modes those types of players now have a mode where they can play how they obviously want to play, leaving quick play for us folks who appreciate objective play. So, in my opinion, deathmatch will benefit the game greatly in the eyes of everyone who plays; either you get the mode you want or others get the mode they want letting your mode go back to how it is supposed to be. All in all this is exciting news that will lead to a lot of fun for everyone and even (hopefully) solve some of the issues involving the intentions of the game’s player base in objective modes. There’s no word yet on an official release date, but Kaplan said soon in the developer update so I’m assuming that maybe after the Summer Games Event we will get an update to add these modes into the core game.